Since the entire episode is set in Arkadia, it makes it difficult to split the recap into the usual 'Honest Scenes.' Instead I'm going for a more traditional recap and commentary, so bear with me. The episode opens with two Trikru warriors riding up to Arkadia. The gates open, and Bellamy steps out, with Pike not far behind. The warriors tell Bellamy that Arkadia is surrounded, but if Arkadia surrenders Pike, things will be smoother for them. The warriors urge Bellamy to think of what's best for his people, to which he responds, "I do that every day," and shoots them both in the head. Bellamy's 'theatrics,' as Pike called them (like you've never done anything theatrical, Mr. Pike, sir), have placed the camp in an urgent situation. Their food and water supplies are under sixty percent, and they don't have enough ammunition for sustained gunfire. The mounting tension results in a game of cat-and-mouse where Pike orders Monty and Bellamy to spy on everyone else in camp. Monty is still conflicted about this, but after all, he loves his mother, Hannah, and she's on Pike's side. Bellamy doesn't seem to have this confliction, and when Monty says Kane and Sinclair are up to something, Bellamy arrests Sinclair and throws him in jail along with Lincoln and the 'interned' Grounders. Everyone is spying on everyone else--Miller's boyfriend, Bryan, puts a bug in his jacket. Miller and Harper have Pike's office bugged. 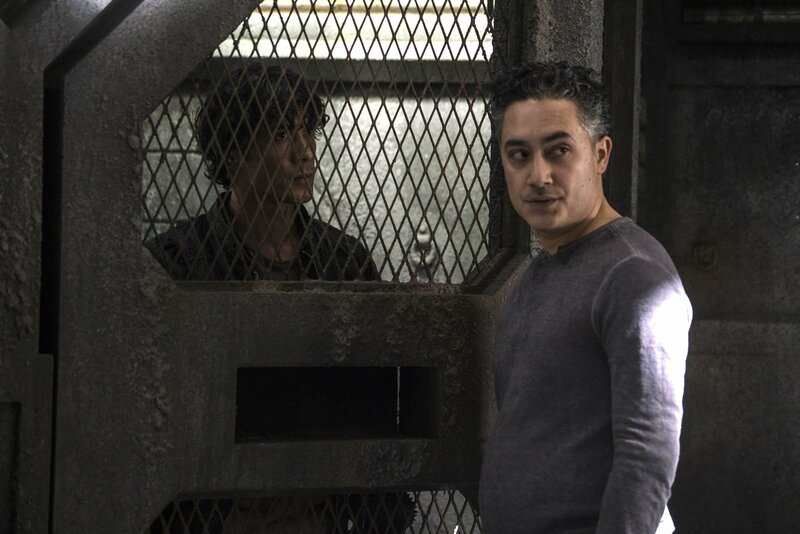 Fortunately for Sinclair, getting imprisoned was the plan--he gives Lincoln a message, and they start a riot in the prison cell to distract Bellamy and Co. while Kane knocks Pike out and attempts to drive him out of Arkadia, where he can hand him over to the Grounders. Unfortunately for Kane, Monty catches wind of the plan thanks to the bug in Miller's jacket, and he alerts Bellamy. Bellamy rushes out to the gate just as Kane arrives, and Kane shouts at Bellamy to move out of the way. Bellamy does not move. He has a gun pointed at Kane, and Kane is in a position to run Bellamy over, but they both remain frozen until Pike's reinforcements arrive and drag Kane out of the car. Pike sentences Kane to death for conspiracy, treason, and attempted murder, and Bellamy's is shocked that Pike would go that far. He confronts Pike, asking, "So we're killing our own people now?" but he makes no headway as Pike assures him it's necessary in order to keep peace within the walls. He says Kane must be an example to keep everyone else in line, and Bellamy walks out, distraught. He stands in the hallway next to Monty and asks about Harper and Miller, who they both know were in on Kane's plan. Just then Hannah walks up and assures them they both did the right thing--then asks whether they know anyone else involved in the conspiracy. Monty glances at Bellamy, looking for direction. Bellamy says no, they didn't find anyone else. Monty confirms the lie. Hannah restates the sentiment from the beginning of the episode, claiming that it really is easy to do what you have to do in order to protect your people. With a resolve we haven't seen in over a month, Bellamy says, "I do that every day." The subplot for this episode featured Raven getting Jasper's assistance to break into Pike's office and steal the City of Light Pill-Maker. We discover that somehow whenever someone new joins the City of Light, ALIE gets stronger. How? I don't know. So far, it doesn't make any sense. Jasper mentions Finn, and Raven realizes that she can hardly remember Finn. In fact, there are a lot of things she can't remember--her first kiss, Finn's death, the necklace around her own neck. She begins to fight against ALIE's influence, and they rush out of the office, leaving the pill-maker inside. Cue to a very baffled ALIE, and Jaha casually implying that he can force Raven to help them in spite of her misgivings. The show does not resume until March 31st, and we can only assume that the last two episodes have really set the stage for whatever's about to happen next. Conclusion: The writers are barreling through this show at breakneck speed, and while it's letting us see more story lines, it's also rushing at a ludicrous rate. Plot and character developments are being sacrificed, thrown under the wheels, in favor of a quicker pace. Things that truly need time to develop are happening over the span of one episode. Character development (or non-development) is falling short of feasibility because the writers seem desperate to get things done as fast as they possibly can. Pike's character had the potential to be fascinating and complex, but the writers aren't giving him time to be these things. The actor is doing the best he can with what he's given, but it isn't enough for us to feel truly conflicted. The biggest problem, though, is Bellamy. He went from a self-centered, anarchist bully to a selfless, peace-keeping protector, and yet now he's touting the rule book and obeying the Chancellor simply because…well, the Chancellor is in charge? What happened to "whatever the hell we want?" In the last season, he was willing to be a foot soldier, to be a bodyguard. He didn't need to be a Right Hand Man; he was willing to do the right thing, no matter his position. Has he changed since Season One? Obviously, but there's no way he would have arrived at a place where he thought all authoritative rule was correct. In Season Two, his willingness to be a foot soldier was convincing. He was helping Clarke do right by their people, and he was just as important to them as Clarke was. Bellamy was the leader on a personal level while Clarke was the leader on a political, diplomatic level. In this season, Bellamy has been reduced to a soldier serving a man he disagrees with. Pike's manipulation of Bellamy is very obvious, and Season Two Bellamy would have seen right through it. Heck, even Season One Bellamy would have scoffed in Pike's face. Still, I have to give a huge amount of credit to Bob Morley. His acting remains beautiful, powerful, and nuanced in spite of the way the writers are careening through the show. He isn't given much to work with, but he does an incredible job making what he is given work as well as it can. One parting note: ROAN RETURNS IN THE NEXT EPISODE. WHO'S EXCITED? Did you catch the episode? What did you think?